The Lumbermens' Arch is probably the most unique attraction in Vancouver. There is nothing like it in the entire world! This is actually the 2nd Lumbermen's Arch. The original was more of a building structure. It resided at the same location from 1913 to 1947 when it was in disrepair and removed. This Lumbermen's Arch was built in 1952. The original arch became a common gathering place for Vancouver residents. Now, this area is still a gathering place where there are many events and a popular picnic area. Be sure to walk to the lower end of the Lumbermen's Arch to see the plaque! In 1912, the BC Lumbermen and Shinglemen's Society honoured the Duke of Connaught, son of Queen Victoria, with an arch to mark his visit to Vancouver. A career soldier, the Duke was beloved by many Canadians for his role in strengthening Canadian military forces and promoting hometown charities. He also served as Canada's Governor General from 1911 to 1916. The Duke's procession passed through the arch in Vancouver's downtown core. Following his visit, the arch was moved to this site. Due to decay, the wooden arch was replace by the cedar archway you see today-built in 1952 to honour BC's Lumber industry. This arch was erected in 1952 by the Board of Park Commissioners and the British Columbia Lumber Manufacturers Association. 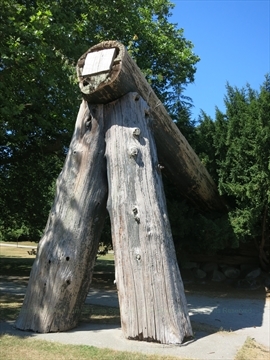 The original Lumbermen's Arch known as the Bowie Arch was built in 1912 on Pender Street near Hamilton Street in honour of the visit to Vancouver of the Duke of Connaught, Governor General of Canada at that time. The original arch was moved to this site and was a familiar landmark until dismantled in 1947. 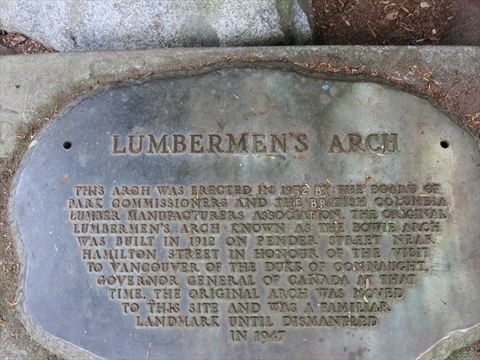 Where is Lumbermens Arch in Stanley Park? The Lumbermens Arch is located on the north side of Stanley Park, just off off Stanley Park Drive and the Stanley Park Seawall. The Vancouver Aquarium and the Miniature Train are nearby.